Trying to decide what kind of bread to buy? What granola bar, cookie, snack food, bagels, banana bread, or what pancake mix is best? Make sure the package says “whole grain”, so that you get all the vitamins and fibre from the bran of the grain. Manufacturers are tricky about hiding refined grains, labels with “multigrain, or “stone-ground” or “100% wheat”, “cracked wheat”, “seven-grain” or “bran” are usually NOT a whole grain product. They are trying to hide the fact that they are using non-whole grains. Look for the specific words together “whole grain” in front of the ingredient. Such as “whole grain wheat”, or “whole grain corn” or even “whole grain white wheat” (white wheat is a type of wheat). Then, apply the 5-to-1 rule to double-check it’s healthy. Dr. Gregor from NutritionFacts.org recommends the 5-to-1 carbs to fibre rule in his book How Not To Die. This book is full of information about foods and studies showing how certain foods prevented or reversed or caused disease in study participants. The 5-to-1 rule says: choose products that have a ratio of carbohydrates grams to fibre grams that is 5 or less. Refined grains are going to have a higher ratio than 5 because they have too many carbs and not enough fibre. Look at the Nutrition Facts on the package, divide the grams of carbs by the grams of fibre, if it is 5 or less, then it’s a healthy product. If the result is more than 5 then you are not getting enough fibre compared to the amount of carbs in that product – skip it. A ratio higher than 5 means it’s probably made from white flour and or has a lot of sugar added. the Blue Menu pancake mix that I veganized in my Whole Weekend Waffles recipe, has 21 g of carbohydrate and 5 g of fibre. 21 g / 5 g = 4.2 carbs to fibre ratio – the ratio is 5 or less and is low enough to fit in the healthy category. For Aunty Jemima Carbs: 27 g / Fibre 1 g = the ratio is 27. Wow! Big difference. Definitely over 5! Avoid products like this. Something for you to know… breakfast cereals are going to be higher than 5 for the most part… not healthy. Too much sugar, not enough fibre – ’cause guess why? They are too processed. Why Does the 5-to-1 Ratio Matter? More fibre per carb gram means the grain is closer to it’s original natural state. There is more about this in the How Not to Die Book, but some important information to know is that when grains are ground into flour or puffed, they are handled by our bodies very differently than whole intact grains. Ground flours are digested more rapidly and completely. This raises their glycemic index and leaves fewer leftovers for the microbiome of bacteria in your gut. When grains are processed into flour, almost all of the starch is digested in the small intestine, leaving nothing for your lower gut bacteria. If this happens a lot in your body, it results in an imbalance, and bad bacteria can take over and increase your chances of inflammatory diseases or colon cancer. So, ground whole grains are better than refined because they leave more behind for your gut bacteria, and unprocessed intact whole grains are the best. If you want to go even healthier with your breakfast, skip grains that have been ground into flours, and go for intact whole grains – like oatmeal. I find people are very curious about why we don’t use oil in our cooking, many have never even considered the idea. People think oil is good for them, but when I ask them what bad things happen to a person who stops eating oil, they don’t have any answers! We haven’t used oil in our kitchen since 2013 and I recommend you don’t either, starting now. This post outlines the reasons. Oil is not natural – it was a food, then we strip almost all the nutrients out. Oil is the opposite of a whole food. It is one of the most processed things you can eat. What is left in oil is: too many calories, harmful inflammatory properties, and artery clogging sludge. It is bad stuff. To make cooking oil, companies take 1000’s of whole food items – like beautiful olives or corn or coconut – and crush them, strip out the fibre, the color, the phytonutrients, the taste, the protein, the carbs, until we are left only with the fat. Nutrient empty fat. 1 tablespoon of olive oil is equal to about 45 olives, and very little vitamins and minerals. It takes more than 1300 olives to make a 32 ounce bottle of olive oil. Why not just eat the olives instead? Then you get all the nutrients in the whole-food package – the way nature intended. You are WAAAY better off to blend or add olives, seeds or nuts to your cooking, than to add oils. Eating whole foods gives us little doses of the fats we need, in low-calorie amounts, and healthy disease preventing packages, that our body recognizes and can use to make us healthy. The fat that makes up oil is not shelf stable, so we process it more. Oil would go bad within days, so companies process it more to make it last longer – altering it’s chemical makeup again. Making it less natural and less of a food our body can benefit from. You have probably heard of Trans Fats? They are not safe for human consumption. Artificial trans fats are created by bubbling hydrogen gas through vegetable oil, to make it solid at room temperature and give a longer shelf life. Trans Fats are killers, for every 2 percent of your daily calories that come from trans fat, your risk of heart disease increases by 23 percent. Artificial trans Fats were banned in New York City restaurants in 2006, and the food industry has until 2018 to remove artificial trans fats from all packaged foods sold in the USA. Please, don’t tell yourself your oil is ok because it is not very processed. Oil consumption leads to inflammation in your blood. You can’t always judge health by how fit or thin a person looks. A study published in the Journal of the American College of Nutrition found that a high fat diet raised inflammatory proteins in the blood by 25%, even though the study subjects lost weight. Subjects who lost the same amount of weight, but ate low-fat and high-carb, lowered their inflammatory blood protein levels by 43 percent. High inflammation leads to disease including heart disease and cancer. Oil causes plaque and clogging in your blood vessels. Studies have shown that blood flow decreases drastically for many hours after a fatty meal. Bringham and Women’s Hospital researchers reported, after studying more than 2,000 cardiac patients. the risk of heart attack jumps by 400 percent immediately following a heavy, fat-rich meal. In the Mediterranean, people who ate the most olive oil, were far more likely to have heart disease. Crete University found that subjects who ate the most olive oil, had the most heart disease. Olive oil is NOT heart healthy. People are healthier on a Mediterranean diet because of eating more vegetables, not because of oil. Oil suppresses your immune system. According to the National Institutes of Health – making you vulnerable to infections. and reduces your body’s ability to stop the growth of cancer cells. Dr. Caldwell Esselstyn says: “oil is the gateway to vascular disease”. Cardiovascular disease leads to a shorter life, and lower quality of life, due to problems like strokes, dementia, heart attacks, erectile dysfunction, and a number of other degenerative diseases. Multiple studies have found that eating all oils – including saturated (coconut, animal fat, dairy), monounsaturated (olive, canola, peanut, avocado oil) and polyunsaturated (flax oil) increased artery plaque that leads to heart attacks. It doesn’t matter whether it is olive oil, corn oil, coconut oil, canola oil, flax oil, fish oil, or any other kind – avoid ALL oil. Oil hurts you from the inside. Whole foods bring multiple benefits to our insides, oil only brings harm. So why eat oil? There is no good reason. Instead of oil, eat a whole plant. All plant-based foods contain healthy essential fats – just like they have protein and carbohydrates. For example, Oats – 16% fat Kale – 11% fat Grapes – 9% fat. For a great source about oils and why eating a whole foods plant based diet is so good for you, look at any of the Engine 2 books, by Rip Esselstyn – he is great at explaining nutrition concepts in easy language, and cites all the sources for the research. His family has eaten this way since the 1980s and they are thriving too. Check out the whole-foods no oils Recipes my family eats here. Whole foods taste awesome, and give you all the fats your body requires to glow, and shine, and grow, and be moisturized! Today is the perfect day to start eating plant-based. Many people struggle to quit eating meat because they think it has a positive influence on their life. There are two common positives that get cited: meat builds muscle and provides more energy that plants. For one, muscle is built from resistance to stress, not what you eat. 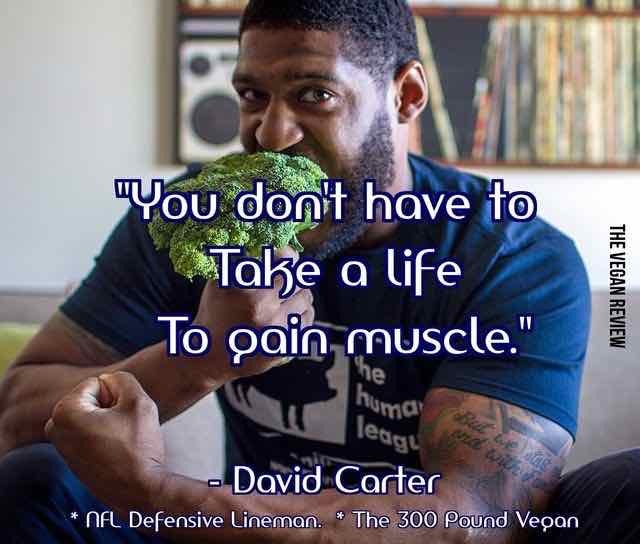 Meatless athletes are muscular! The more you do with your muscles, the larger they will be. Then there is the extra energy that animal protein supposedly provides. Think about how you feel after a large turkey dinner, or an all you can eat buffet with cheese and ice cream – like you need to lie down! Your body struggles to process animal proteins and fat. With that struggle comes stomach aches, indigestion and weight gain from too many calories. Whole foods plant based meals do not make you feel like taking a nap! The only reason a person feels like meat and dairy provide energy is because that is the only way they know how to eat. Once you realize that there are no positives to eating animals, the appeal of meat and dairy dips, and changing to plant-based becomes a lot easier. For more on how to plan plant-based meals, read the post: How to Eat Vegan for Energy and Weight Loss – For Adults and Kids and check out these Whole Foods Plant Based Recipe Ideas. Some natural nut butters may have salt added, but truly natural peanut butter will have no other oils, sugars, flours, salt or preservatives in it. Natural peanut butters can be chunky or smooth, just like processed peanut butter, and may be organic, or not organic, depending on the peanuts used. Organic is not the same as 100% peanut butter. .
Natural peanut butter has not been processed to make the oil a solid, oil will separate out at room temperature. Why Use Natural Peanut Butter and Nut Butters? Once you start eating natural peanut butter, the processed kind will taste like FAKE FOOD – a pastey, sugary, candy, floury, weird substance. Processed peanut butter reminds me of frosting/icing or what is inside of Reese’s pieces candies. More like candy than peanuts. Natural peanut butter has a richer peanut taste and more peanuts per spoonful because it has no fillers. It tastes real. Over 20 studies found that eating a small amount of whole nuts daily made people lose weight. Read more about how adding a handful of whole nuts a day can make you feel so satisfied that you eat less. Nut butter worked too. Natural peanut butter has not been hydrogenated – chemically processed at high temperatures to change the molecular structure of the oil, and stop the oil from separating. Processed peanut butters contain added sugars, flours, and oils you don’t need. Natural nut butter is simply real peanuts, or almonds, or seeds, or cashews etc. and none of the original nutrients from the nuts have been stripped out or altered. Whole foods are better for us, our bodies know what to do with them. We should all avoid harmful artificial trans fats, used to hydrogenate vegetable oils into a solid. Trans fats raise the risk of heart disease, increase bad cholesterol levels and reduce good cholesterol levels. Governments are banning trans fats to protect us. However, with trans-fat nutrition-labeling rules, products labeled “0 trans fats” can still contain up to half a gram of trans fat per serving. You can assume that “trans-free” processed peanut butter still contains a small amount of trans fat if partially hydrogenated oil is listed as an ingredient. Avoid processed peanut butters and save your body from trans fats. 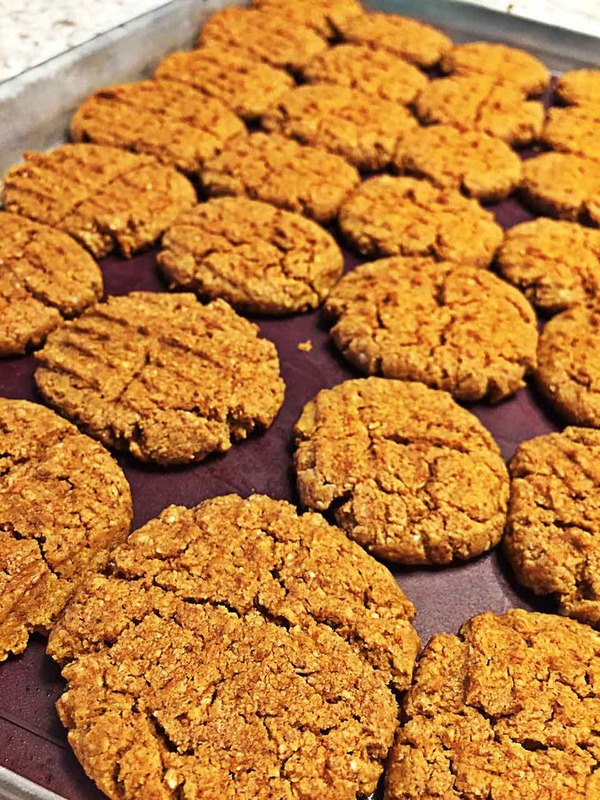 Check out my recipe for Irresistible Peanut Butter Cookies. Natural peanut butter works as a great egg substitute for binding ingredients. 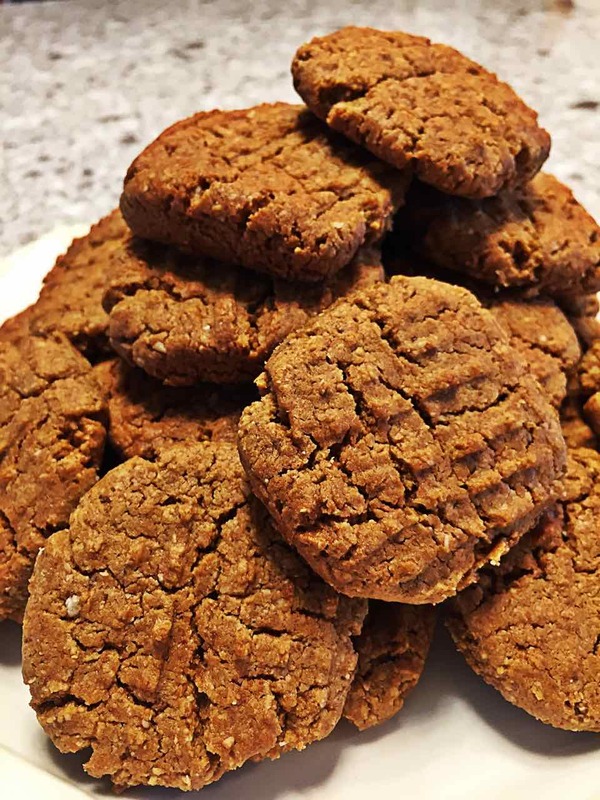 Cookies made with nut butters won’t need oil or margerine, the natural peanut oils make them perfectly chewy, and they usually don’t stick to the cookie sheet. The natural idea applies to more than peanuts – you can find natural almond, cashew, other nuts, and seed butters too. Store the beautiful natural nut butter container upside down in your cupboard. Depending how solid the nut mass is, most of the oil will rise to the bottom. That sounds confusing, but it makes sense! Later, when you open the nut butter, turn the jar upright and stir it with a long tool that reaches to the bottom of the container – I use a stainless steel non-serrated table knife with a dull edge and a rounded point. The oil will rise up through, as you stir, and you can combine the peanut solids with the oil – like they were in the original peanut. I would like to invent a nut butter stirring machine… my husband Greg and I discuss the design. Trouble is it will bounce all around unless it is secured to something. If you are watching your fat intake, you can pour some oil out of the peanut butter before you stir, but leave enough oil so that the peanut butter is spreadable and easy to work with, rather than hard and dry. It takes some muscles to stir natural peanut butter, and it is an inconvenience but, think how good it is for your arm! If you have stored your peanut butter upside down then oil won’t slosh out the top of the container when you stir, because most of the oil will be trapped at the bottom of the jar, under the peanut butter. Also, your peanut butter won’t be a brick at the bottom of the container, the oil will be at the bottom instead. You can stir up the solids without having to dig to the bottom. Once you have mixed the nut solids and the oils, into a creamy, spreadable state, store the jar in the fridge. The cold will stop the oil from separating back out, the mixture will be semi-solid, but soft enough to spread. I hope these tips are useful, and encourage you to try natural nut butters, another step towards whole foods! ? Did you know that adding nuts didn’t make people gain weight? In over 20 clinical trials about nuts and weight, they confirmed adding nuts to people’s daily food intake did not cause weight gain. Not a single one showed the weight gain they were expecting, by adding nuts to people’s diets without asking them to adjust in any other way. In fact most participants lost weight when they started eating a handful or two of nuts, or spoonful of nut butter a day. 2) nuts increased metabolism, so people were burning more fat while resting. Eating nuts can help prevent heart attacks and extend your life. Both men and women can expect lower rates of heart disease with nuts, because nutrients found in nuts help prevent heart attacks. The Harvard Nurse’s Health Study found eating nuts and seeds instead of animal products is a contributor for living a longer life. Dr. Gregor from nutritionfacts.org found up to 55% of men and 68% of women who die from a sudden heart attack, had no clinically recognized heart disease before their sudden death. So, start to eat healthier right now, today – before a heart attack happens to you or your loved ones – and you have no time left to change your food. We should definitely include nuts and seeds in our regular routine! This is what works great for us! Eat 1 – 2 oz of nuts daily depending on your height. 1 oz of nuts a day is enough for a short female (I am 5′ 3″) like me, up to 2 oz a day is reasonable for a 6 foot tall male and growing children. Think of putting nuts or seeds in a shot glass – that is 1.5 oz. Not much, right? It is all you need. More than 1 – 2 oz of nuts or seeds daily will cause weight gain, unless you are exercising more. Nuts and seeds are 80% healthy fat and are very high in calories, we can overdo it (and gain weight) with nuts and seeds, if we eat so many that we are going way beyond our daily calorie needs. Good news is: Nuts Don’t Cause Expected Weight Gain, when people in the studies added a handful or two daily – but, we should not eat more than that unless we are trying to fatten up. Natural peanut butter (the only ingredients are nuts – no added sugar, oils, flour etc.) had the same no-weight-gain results as whole peanuts. Scientists wondered if whole nuts pass through our systems as not chewed, or harder to absorb. They compared weight gain from eating the same calories in both peanut butter and peanuts, and the lack of weight gain was the same. If you are not used to it, see more about How to Use Natural Peanut Butter here. I choose to eat a tablespoon of nuts or seeds with my breakfast. Hemp seeds are one of my favourites. Eating nuts with breakfast reduces my hunger for longer. If I forget to put nuts on my breakfast, I will get hungry within a couple of hours. Just a few nuts or seeds means I can go longer without eating, and when I do eat I am not ravenous. Sometimes, I also eat nuts for bedtime snack, like a spoon of nut or seed butter and dip fruit in it. I like almond butter, peanut butter, cashew and seed butter and I also might snack on a handful (3 – 5 nuts) of walnuts or pecans, with fruit or a small amount of dried fruit. When can you fit a handful of nuts into your day? If I make a meal with no beans, I will use nuts, or seeds, instead of beans, to keep us satisfied. Nut based sauces are high calorie so I serve nuts with a lot of vegetables and leafy greens to keep the meal calorie balanced. Usually once a week, I will make a beans/tofu/tempeh free dinner, or add nuts or seeds with less beans in a meal. Spaghetti casserole with a walnut, basil, spinach pesto sauce (we call it Monster Pie). Thai noodles with vegetables – use a peanut satay sauce. Pasta tomato sauce with blended beans and seeds. Salads – add chia seeds to my homemade salad dressings. Add a heaping tablespoon of hemp seeds per person in our whole grain waffle recipe. Add a spoonful of nuts or seeds to every breakfast that doesn’t have tofu or beans. Now – go make some Irresistible Peanut Butter Cookies with this in mind! The following recommendations are based on hours of research on the latest scientific findings about human populations and measurable effects of diet on longevity and health, from leading plant based medical doctors. Plus, we have used trial and error of different types of meals/proportions and recommend this daily eating guide, based on how we feel ourselves, how much energy we have, how much we weigh, and what our kids want to eat. When we first went whole foods vegan we lost weight very quickly, results are immediate. You can expect the same. Greg lost 20 lbs down to 190 lbs and I lost 6 lbs down to 122 lbs in 4 weeks. I especially noticed weight loss on my upper arms, around my ribs and my legs. I bet we lost a lot of fat around our internal organs too, fat there is really unhealthy. my husband had gained weight (even as a vegan) back up to 210 lbs and I was feeling low energy, but still weighed about 122 lbs. Increasing our dark leafy greens resulted in fast weight loss and higher energy. In April of 2017 we discovered Dr. Furhman’s recommendations and increased the proportion of the most nutritious vegetables (leafy greens) eating those instead of as much whole grains. My husband went from 210 lbs to 193 lbs in 4 weeks eating more dark leafy vegetables. I went from 122 lbs to 115 lbs, and my energy levels went way, way up. Based on our trials and experience since 2013, I share our vegan eating tips with you. For us the key to staying vegan is to remain focused on our health goals and environmental goals. It’s really quite easy to stay whole foods vegan because our stomachs feel so much better, and if we eat animal products we don’t feel good. Use these pie chart proportions to plan the best way to eat vegan, for lots of energy, and to lose and maintain weight without effort. We are still gradually losing weight eating the following way (unless we get lazy and eat a bunch of restaurant meals, or buy a packaged snack). I expect I might stabilize around 112lbs and Greg around 185lbs – right at the weights Dr. Furman recommends for our heights for maximum life span. Studies show skinny people live longer. Use the percentages in the adult vegan proportions pie chart as a guideline for a single day. For adults, think about meals as firstly being composed of a vegetable (lunch and supper) or fruit (breakfast), then add a little whole grain starch and some protein or nuts with a no oil dressing/sauce/spices. If you want to lose weight really quickly, and actually increase your energy, start most adult lunch and supper meals with a plate of dark leafy greens, like spinach. Pile the meal (made of vegetables, starch, and protein) on top. Have a fruit for a bedtime snack. Beans are the perfect protein because they are the right amount of protein and carbs. You can eat vegetables and beans with no starch and get lots of energy. This makes a great lunch. Typically we will add a bit of starch at dinner, because it tastes great. Use the percentages in the children vegan proportions pie chart as a guideline for a single day. For kids, because they need more energy, and can resist some vegetables and resistant to sauces that give calories, think about kids meals as first being composed of a whole grain starch such as potatoes, brown rice, whole wheat bread, whole grain pasta, corn, or quinoa. Then fill 1/3 the plate with vegetables or fruit and 1/4 with a protein. Most kids love tofu and plain beans and lemon juice as a sauce. I get my kids to eat dark leafy greens by including spinach or bok choy in soup, pizza sauce, and spaghetti sauce. Especially in soup. We eat soup once a week for supper plus lunch leftovers. They enjoy plain romaine lettuce, but we are working on salads more than that. It is a work in progress. My kids love plain broccoli, cauliflower, brussels sprouts, sweet potatoes, carrots and cabbage. They really love plain vegetables. So they eat vegetables every dinner and most lunches as leftovers. Our conflicts usually come from the fact that Greg and I want spices and sauces on our meals, the kids don’t. Our kids eat whole grain cereal (Cheerios, Mini Wheats) with unsweetened soy milk for weekday breakfast, and whole grain waffles with loads of berries on top on weekends. They like fruit and smoothies and toast with fruit for snacks. Eat only whole plant based foods. As much as possible, choose “whole foods” – which means not altered from how it grew. Olives instead of olive oil, an apple instead of apple juice. Beans instead of protein powder or vegan nuggets. For pasta, rice, oatmeal, and bread, whole grain instead of refined. Whole wheat instead of white flour, brown rice, brown pasta, stone ground oats, or quick cooking oats, quinoa, barley, cornmeal. Whole grains are the whole grain kernel with the bran, germ, and endosperm intact. Refined grains started out as whole grains, but then are processed to give them a finer texture and longer shelf life. During processing, the bran and germ are removed, which also removes dietary fiber, iron, and many B vitamins. Edamame soy beans are better than tempeh which is better than tofu which is better than soy milk. Choose a rainbow of colours. Try for some green and cruciferous vegetables daily. Start adult lunch and supper meals with a plate of leafy greens. Pile the meal on top. Eat a variety of fruits and vegetables over the course of a week, and over a month. Choose foods that have the most nutrition per calorie. This is the secret to high energy. Vegetables have the highest nutrition per calorie. Only eat foods that contain fibre. Animal products contain no fibre. Processed foods with oils added often have reduced fibre. High fibre ensures wonderful digestive regularity and health, poop once a day, no bloating, no acid indigestion, never diarrhoea, and no smelly gas. Cook supper at home most of the time. Eat leftovers for lunch. Entertain company often. Our house, our food. Avoid processed food and drinks. No soda pop, no candy bars, or candy. No purchased bags of snacks. Limited juice. Especially green tea. Glorious tea. Do not cook with or use oils, margarine, or any added fats. All veganEnvy recipes are no oil, fat-free. Oils reduce arterial function and cause inflammation inside our bodies, plus they clog up our blood vessels leading to heart disease, erectile dysfunction, stroke, alzheimers, obesity and dementia. Use dried dates/fruit instead of sugars and syrups. Sugar (even less processed sugar, like brown sugar, honey and maple syrup) cause inflammation, dried fruits repair it. Eat every two hours and take snacks with you everywhere you go. Keep your body running and humming by continuously feeding it healthy nutrition filled fibre. Take an apple, or orange, or yellow pepper or carrots or a banana with you if you run errands. Have nuts and dried fruit in your desk drawer or whole grain fig newton type snacks for emergencies. Choose whole fruits as snacks in between meals as much as you can. Schedule a daily 3:00 green smoothie to stay energized throughout the afternoon and then you won’t get too hungry before dinner. Eat no animal products, no dairy, no fish, no eggs, no poultry, no beef. No cheese, no sour cream, no yogurt. If came from an animal do not eat it. You don’t need to eat organic or non GMO to get serious benefits and results from a plant based diet. The health benefits of a diet rich in fruits and vegetables outweigh the risks of pesticide exposure. We buy much of our produce in bulk at Costco, a good portion is organic, but not all of it. The highest concentrations of pesticides are in animals, because they eat a lot of plants and it concentrates in them. You are avoiding that. Accept that society makes it hard for children to eat vegan, (think birthday parties, school snacks, friends houses, kids menus) we let the kids pick what they eat when they are not in our house. This usually means they eat animal products once or twice a week. Eat added oils in restaurants, but try to avoid them. Research in advance and choose restaurants with better healthy low fat vegan choices. Drink low to moderate amounts of alcohol. on some weekends. Ok, sometimes we drink high amounts of alcohol, but we notice we recover quicker now that we are plant based, so hopefully we aren’t damaging our bodies too much! We used to drink Almond milk, but I feel more energetic after soy milk, and I want the kids to get the protein from their drinks, so that is what we drink. Typical examples for us include walking, Beachbody workout videos, jumping on our trampoline, swimming, watersports. Practice body alignment exercises daily. As we got older, we started suffering from aches and pains caused by our computer desk lifestyles. The Pain Free book by Pete Egoscue gave us a way to simply manage muscular-skeletal issues from toes to top of our head, with simple exercises you can do while watching TV. Changed my life. My favourite is a whole fruit (oranges, apples are great) and a glass of low fat soy milk (about 70 calories per cup and 6g protein). I can wake up in the night if I don’t have some protein (beans, nuts or soy milk) before bed. If I have my protein snack I sleep soundly through the night. If I do wake up, I drink a glass of soy milk and it puts me right back to sleep. The rest of my family just likes fruit as their bedtime snack. This habit ensures they get fruit every day. Use as many different spices as you can on every single meal. Spices are concentrated plants and we are just learning about all the phytonutrients and benefits spices convey. For example, 1 tsp daily of ginger powder totally works as a pain killer, especially for headaches and menstrual cramps. Try it! Please, let me know what you think and if you are confused about any of these recommendations in the comments! Check it out! JOIN, recommend to vegan friends, this community is a vegan safe place to chat, joke, and share and make vegan friends. With no annoying pictures of non-vegan food, surrounded by vegan LOVE. Iodine – how much do you need and how should you get it? Everyone needs iodine, but it’s especially important for vegans, since many healthy plant foods like flax, soy, and broccoli have compounds, which can interfere with thyroid function in people with not enough iodine intake, and cause goiter/goitre (British spelling) a swelling of the neck because of enlargement of the thyroid gland. Does that mean you shouldn’t eat these “goitrogenic” foods? Definitely not, they have too many other benefits for you (preventing cancer and fibre, for example). You just need to get the right amount of iodine in your diet. If you cook with salt, then use iodized salt, instead of using natural sea salt, and you’ll probably get all the iodine you need. Iodized salt contains 71 mcg of iodine in 1.5 g (approx 1/4 teaspoon) of iodized salt. But what about whole foods vegans who avoid salt and oil? If, for good reason, you don’t add salt to your food you need to get your iodine somewhere. The best source of iodine is sea vegetables – or you can get it in iodized salt, or in a multivitamin. 7 grams of this dried seaweed has 70% of a person’s daily iodine needs. Don’t cook with iodized salt? Seaweed is a good tasty option for getting iodine. This table from the World Health Organization lists the recommended dietary allowances for iodine. I urge you to get some dried, oil free, nori seaweed and start adding it to your meals, both for taste and for iodine. Seaweed is especially tasty in soup. Try my Bok Choy Tofu Soup, it calls for seaweed. Dried seaweed adds a salty, base flavour and it is good for you, more than just for iodine. Studies have shown seaweed inhibits human cancer cell growth, this video outlines a study where scientists found seaweed may have therapeutic potential for liver cancer. Also, sea vegetables have lots of B vitamins and minerals – particularly iodine. Just don’t overdo it with the seaweed. A problem with seaweed is: we can get too much iodine. The World Health Organization places the safe upper limit for iodine at 1,000 micrograms a day for adults and 90 – 120 mcg for kids (depending on age). Eating 300 micrograms or so of iodine could be too much for a five-year-old. Make sure you and your family are within the daily limits for iodine by checking the seaweed label. A little seaweed goes a long way as far as flavour is concerned, by adding a small amount to some of your meals you will find it is quite easy to get the amount of iodine you need, without going over. Curious about tofu? Here is some information compiled from quality sources about how food manufacturers make tofu, what ingredients go into tofu, and how to choose, buy, and prepare the different types of tofu varieties. Learn about tofu taste, nutrition, protein content, fiber, benefits, calories, and is tofu healthy or not?? Tofu is made from mature white soybeans. The beans have been soaked in water, ground up and cooked and then filtered to make a milk. How Long Have People Been Eating Tofu? There is written evidence to show that soymilk existed in China by 82 AD, and may have existed several centuries before that time. Evidence about tofu is less clear. A theory is that tofu was invented about 2000 years ago by a Chinese cook who accidentally curdled soy milk when he added nigari seaweed as part of salting it. There are two types of tofu: Regular and Silken. Curdled milk. To make Regular (harder) tofu the milk is curdled and then the liquid is pressed out of it. This is much the same way that traditional dairy cheese is made by curdling and solidifying milk. The liquid (whey) is discarded, and the curds are pressed to form a cohesive bond. Regular tofu is also called soybean curd or bean curd and comes in different hardness varieties. To make Silken (softer) tofu the soymilk is coagulated without curdling the milk. It is left unpressed and because curds never form, Silken tofu has a smooth and silky appearance. Here is a description of the process to produce tofu, from a video that shows one manufacturer in detail. Soy Beans (the seeds that grow in the pods of the soy bean plant) are soaked in water, as they absorb the water they double in size and soften. The swollen beans are are crushed and filtered to make a soy soup / slurry. The ‘soup’ is transformed into a paste by being cooked in a steam cooker for a few minutes. Then, a spinner separates the milk from the pulp (called soy meal). The soy meal pulp goes off to be sold for cattle and pet food, the milk stays behind to be transformed into tofu. While still hot the milk goes into a coagulation tank to be thickened into curd. It is at this point that flavors may be added. A coagulant like calcium sulfate, magnesium sulfate, or traditionally nigari is added to the soy milk along with water to activate it. After about 15 minutes the milk congeals into soybean curd = tofu. Nigari is the dried liquid (mostly magnesium chloride) that remains after common table salt has been removed from seawater. Once curdled the soymilk it is still hot and soggy and is run through a filter to drain it as much as possible. Now the bean curd is relatively dry and is transferred into large trays lined with cheesecloth and pressed, which squeezes out most of the remaining liquid, and molds the tofu into firm large blocks. Pressing it longer squeezes out more liquid and makes the tofu firmer. The large blocks are cut to be smaller store sized blocks and are packaged. To kill any bacteria, packaged blocks are heated for about an hour and then cooled in a cold water bath. Is Tofu Healthy? Is Soy Healthy? The Chinese honored soybeans as one of the five sacred grains essential to the existence of civilization—the others were rice, barley, wheat, and millet. They considered the soybean to be both a food and a medicine. Extremely versatile and high in nutrients, soy foods such as soymilk, tofu, miso, and tempeh are all derived from the soybean, a legume that was first cultivated in northern China about 3,000 years ago. However, the nutritional value of any given soyfood can vary greatly, depending on how it was processed. With only about 164 calories per 4 ounces of firm tofu, tofu is a good, high-protein substitute for meat and whole-milk products. Tofu is high in fat, with almost 10 grams per 4 ounces, though the fat is mostly unsaturated. Tofu is healthy because it is high in protein, is an excellent source of calcium and iron and contains all the essential amino acids your body needs. It is cholesterol free, sodium free, it contains healthy fats, carbs and a wide variety of vitamins and minerals with a low number of calories. Several national dietary guidelines, including Canada’s Food Guide, recommend soy foods as part of a healthy diet. Did you know? Soy beans contain 40% protein, more than double the protein in beef or fish. Tofu contains the healthy Omega-3 fat, 2 grams for 1 1/2 cups of tofu. Omega-3 fat is an essential fatty acid, the body cannot manufacture it, and it is required for health. Omega-3 fats are anti-inflammatory. Studies have shown that consuming tofu regularly instead of meat and dairy results in significantly lower total cholesterol, triglycerides, and low density lipoprotein (bad cholesterol). The micronutrient content of tofu varies, depending on the coagulant used to make it. Nigari or magnesium sulfate adds magnesium, calcium sulfate increases the calcium content. Check the ingredients list for calcium sulphate, and read the Nutrition Facts table to see how much calcium is in the tofu. Different brands may have different amounts of calcium. Take a look at some of our favourite dinner tofu recipes. Tofu contains fibre, which greatly contributes to digestive health – animal products contain zero fibre. There has been controversy about soy and breast cancer. The medical community was warning women with breast cancer to avoid soy because of plant oestrogens in it. Contrary to this advice, the latest studies are finding that soy is preventative for breast cancer and also helps people with breast cancer to survive longer. Recent studies now show that women who have had estrogen-sensitive breast cancers do not need to avoid soy isoflavones. The latest recommendation for breast cancer patients to consume soy foods is consistent with the fact that breast cancer occurs much less in countries where soy consumption is high. Is genetically modified soy safe? The genetically modified beans appear to be safe, but the chemicals sprayed onto them are not. The genetically modified genes in GMO soy were not detectable in the human body, leading researchers to conclude that they are harmless. Note: genetically modified corn proteins were found in humans, but those were also found to be harmless. Research has found risks to people may not be from eating a genetically modified plant, but from eating the pesticide residues that were sprayed on the GMO plants. 80% of GMO crops are bioengineered only for pesticide resistance. The top 5 biotech companies are chemical companies that manufacture pesticides. Monsanto’s Roundup has been shown to have adverse effects on human placental tissue. Glyphosate, the active ingredient in Roundup didn’t seem to have much of a toxic effect on human cells even at high doses, or have much effect on a hormone-regulating enzyme, leading Monsanto-funded reviewers concluded that regardless of what hazards might be alleged based on animal studies, glyphosate is not anticipated to produce adverse developmental and reproductive effects in humans. But pure glyphosate isn’t sprayed on crops. The Roundup formulation – which includes a variety of adjuvants and surfactants meant to help the glyphosate penetrate into tissues – was found to be 100 times more toxic than glyphosate itself. Similar results were found for other major pesticides. It took until 2014, but 8 out of 9 pesticide formulations tested were up to one thousand times more toxic than their so-called active ingredients, so when you just test the isolated chemicals you may not get the whole story. When the study was repeated with what’s actually sprayed on GMO crops, there were toxic and hormonal effects. Roundup turned out to be among the most toxic pesticides researchers tested, contrary to a popular belief that RoundUp is harmless. What about conventional non-GMO soy where glyphosate is sprayed on the soil to kill weeds between crop cycles?… No residues on the plants. What about Organic Soy? No residues. At this point, steering away from GMO soy because GMO plants are sprayed with a larger dosage of chemical pesticides than non-GMO plants, might make sense. When buying tofu, you must decide what brand and what hardness will be the best tofu for your recipes. From soft to extra firm, common tofu textures are broken into two categories: Silken (Soft) and Regular (Firm) Tofu. Extra firm tofus are best baked, grilled and in stir-fries, while silken tofu is suitable for sauces, desserts, shakes and salad dressings. One manufacturer’s Firm tofu may be more or less dense than another’s. Click on the types below to view information about each variety of tofu, how to prepare the tofu and best uses for each type of tofu. Silken Tofu has the highest water content and resembles pudding or white jello and can be available in soft, firm or extra firm. Prep: Just drain if it is stored in water and optionally blot it with a paper towel. Silken Tofu is good for: Use Silken Tofu for spreads, smoothies, shakes, dips, salad dressings, creamy sauces and some desserts like pie fillings. You can blend soft silken tofu as a good lactose free substitute for light cream or milk and the firm or extra firm silken tofu varieties are a dairy free replacement for sour cream or yogurt. Egg Substitute: Silken tofu can also be used as a vegan egg substitute in some baking (depending what the egg was bringing to the recipe). ¼ cup blended silken tofu = 1 egg. Delicate tofu, can hold it’s shape just barely. It has a mild milky flavour. Prep: Pressing soft tofu is not recommended as you will end up squishing it. Just drain if it is stored in water and optionally blot it with a paper towel. Soft Tofu is good for: Similar applications to Silken Tofu, can be blended and made into sauces and smoothies. Battering and deep frying, a method that fully envelops the cubes, produces tender nuggets. Although you will not see any fried recipes on this blog. Note: Because it has a high water content, soft tofu is not recommended for shallow frying unless you do not use oil, the sputtering and spit-back can be dangerous. Will hold it’s shape, has a rougher texture than soft and can crack when handled. Has a droopy appearance due to moisture. Medium Tofu Prep: Can be gently pressed to reduce water. It will squish out of it’s shape somewhat easily. Medium Tofu is good for: mimicking cottage cheese and ricotta cheeses. Use in gently simmered soups like miso soup or serve cold. Medium Tofu Tips: Add it to your recipe at the end of cooking to reduce breakage and crumbling. As firmness increases, the cooking time to bake or fry out the excess water goes down. Holds together well, even in a stir fry or recipe where you are stirring a lot. How well it holds together can change with the brand. Firm Tofu Prep: Press firmly to reduce water. Firm Tofu is good for: Fairly good for stir frys and pan fried tofu. It will be more moist than extra firm tofu, so do not stir too much, and add at the end of cooking if you can to reduce crumbling. Holds it’s shape very well. Does not absorb flavours as quickly or easily as softer tofu. Contains the least amount of water of any tofu. Extra Firm Tofu Prep: Press to reduce water. Extra Firm Tofu is good for: Extra firm tofu is the best tofu for making crispy tofu, to bake (like making tofu sticks) or grill. Excellent for stir frys, glazing and, pan frying. It can be crumbled and used like ground meat as it will hold up without becoming runny. Try the different textures to determine what you prefer. In our house, we buy mostly Extra Firm Regular Tofu and Soft Silken Tofu. I’ve found the Extra firm will work in almost all recipes, but medium can be too soft for some, such as tofu sticks or stir frys. However, medium tofu has a more gentle appearance and softer feel when eating, so adds subtlety and variety to recipes. Chinese Style Tofu is a regular soft tofu (not a silken), often sold in a pillow shaped package. Japanese Style Tofu is less compressed (it is a silken) than Chinese Style and is sold in square sided blocks. Yuba is made by lifting and drying the thin layer formed on the surface of heated soymilk once it has cooled. It has a high protein content and is most commonly found as brittle, brown sheets that must be reconstituted before use. Once softened, it can be added to stocks, soups, stews, and the like. Lite tofu is lower fat. Tofu alone is relatively tasteless to adults, it is a neutral flavour and mild and bland. I say adults because for my kids, and all kids we have cooked for, they love the taste of plain tofu, so it must have taste for them! To me it tastes mildly bitter, and is not salty, and not sweet and the firmer varieties have a satisfying texture. The silken variety tastes a bit watery to me and I need to add salt or garlic or onion or some other foods to fill out the flavor of the softer tofus. Tofu is like a sponge, it absorbs the flavor of whatever it comes into contact with. Great! You have your tofu home, now what are you supposed to do to prepare tofu before you eat it? Cut open or tear open your tofu package, if it’s packed in water I like to do this over the sink. I let the liquid drain out and then I put it on a cutting board, or for the soft silken varieties I cut it into squares right in the package and pull them out right into my blender or food processor with the same dull knife. In our house we throw tofu away on the day after the best before date because it seems to start to smell bad and the package swells up very quickly after that date. If the package is swollen before this date, it may have gone bad due to lack of proper refrigeration, when in doubt, throw it out. You do not need to rinse individually packaged tofu. Tofu in a sealed package is preservative free and sterile, so there is nothing you are trying to rinse off. Tofu purchased in bulk could have come in contact with contaminants and should be rinsed off. How to Press Tofu – Do You Need To? Because tofu has a high water content, it’s wise to remove excess liquid to make room to absorb new flavors. That being said, I press my tofu if I want it to be more firm in a recipe, I do not press my tofu if I want it to be moist. A quick way to press tofu is to place the tofu on an absorbent paper towel or dish towel and wrap it up around the top. Place a flat surface on top such as a dish or baking sheet and press on it gently to squeeze water into the towels. Some people put a dish under the tofu as well and instead of using paper towels tip the dish so the liquid can drain off. Less waste this way. Go easy until you know how much pressure to put. Medium and softer tofu will start to crack and squish out the sides if you put too much pressure. You can also place a heavy item on top of a plate such as large can of tomatoes and let it sit 5 – 10 minutes while you prep your recipe. Once it is pressed, pour the water into the sink, you will be left with a drier, more firm tofu block. Only press medium, firm and extra firm tofu. Softer varieties will just squish and you will be left with a mess. After pressing and draining your medium, firm or extra firm tofu, stand it on it’s small end on a cutting board and press a knife down the wide side. Cut one or two times, so that you get two or three even wide planks from the block depending how many cubes or tofu sticks you want to end up with. Fit the tofu planks back together into the block shape and lay them flat like in the package, press a medium or long knife through it lengthwise to make 2 – 3 cuts and long rows. Turn it and press your knife through 4 – 6 times to make 16 or 24 rectangles or 45 – 84 cubes (if my math is right!). Adjust the size of your cuts to make larger or smaller cubes or rectangle sticks. Tip: Don’t cut the cubes too small or the slices too thin. That will lead to the tofu overcooking and becoming hard and brittle rather than moist and crispy. Rectangle shaped tofu sticks are good for coating, baking, dipping and eating with your fingers. Small or large cubes are a good shape for tofu in stir frys. Smaller cubes are easier to divide up to a family as some will be in each scoop of the stir fry. Flat thin squares increase the surface area for sauce to coat and are a good tofu shape for pan frying or baking in a dish. You can use baked tofu or raw tofu in a salad. Frozen tofu can be defrosted in the fridge, microwave, or by boiling it in water. Take it out the night before and let thaw in the refrigerator. After it thaws, tofu soaks up marinades more easily since it becomes more porous from the frozen expanded water. It also changes consistency, and becomes chewier. After freezing, the curds are so compact and water pockets so enlarged that liquid drains freely from the tofu with a gentle squeeze. Vegans Don't Just Eat Tofu! I have a lot of non-tofu recipes on this site too. Take a look through my recipes page! Find a whole foods vegan recipe to try! Will expired tofu make you sick? A package of fresh tofu will last 3-5 days beyond the date stamped on the package, depending on it’s preparation method and how the tofu has been stored. Since the soy liquid is thoroughly heated prior to making tofu, killing most bacteria and viruses in the soy, properly processed and handled tofu is not likely to be contaminated. It is not common, but there are a few ways tofu could cause foodborne illness. One of these is contamination of the tofu by unclean equipment at the food processing facility. Another way is at your house by a food preparer with unwashed hands, sneezing or coughing on foods, or if the tofu touches pathogens from another food, such as raw chicken. Tofu may also be exposed to pathogens if stored in contaminated water. There are more safety concerns if you will be purchasing tofu sold in bulk. Tofu stored in a large bin of water could come into contact with unwashed hands or contaminants. Also, unclean water can infect the entire batch of tofu. Store your tofu according to the directions on the package, some require refrigeration while others can be stored at room temperature. Once opened if you are not using it right away, rinse the tofu, cover it with water and keep it in a refrigerated container. To keep the tofu fresh for up to a week, change the water often. Unopened tofu can be frozen in the original package for up to five months. Store leftovers in your refrigerator promptly, as bacteria grow best when exposed to 40 to 140 degrees Fahrenheit (4.4 – 60 degrees Celsius). I haven’t tried freezing tofu yet. The next time I have a package that is about to expire I will try it. My research indicated that if we drain and/or press the tofu first, it won’t be as wet and messy when you thaw it. But it could become more easily freezer burned. Apparently, you can freeze the block of tofu whole, or cut it into the sizes you want beforehand and separate them. The pieces will stick together though, so might not be worth it. From what I’ve read, freezing separates out almost all the moisture, and turns tofu into a spongy substance that quickly absorbs sauces. Feel free to let me know what you recommend when it comes to freezing tofu in the comments. Eating Raw Tofu – Does Tofu Need to be Cooked? Tofu can be eaten raw. Soft and silken tofu are great in salad dressings, or as a sour cream or yogurt substitute in dips and spreads. Regular (harder) tofu can be served raw in salads. Some sources recommend that to be safe you boil uncooked tofu for five minutes before eating it. Personally I am going to ignore this advice. We eat raw pieces of tofu when cooking all the time and we use raw silken tofu in dressings and desserts and have never had any stomach issues. Tofu vs. Tempeh – what is the difference? Tofu and tempeh are both made from soybeans, but the process is quite different. Tempeh contains whole soybeans that are aged and cultured and become stuck together into a firm substance that can be sliced. Tempeh is healthier than tofu because it is closer to the original whole food, it is less processed. It has a nutty drier texture and a stronger flavour than tofu. To make tempeh, soybeans are cooked, usually with grains like rice or millet, and then aged with a special culture that breaks the cooked beans down and binds the mixture into a firm substance that can be sliced. When you look at tempeh, you can see the individual beans bound into a solid paste that makes up the slice or brick. Tempeh contains more protein than tofu, and has a stronger taste. Some are flavored to be smoked or like bacon. My kids are still warming up to tempeh, because it tastes stronger and has a bit of the texture of eating beans. They enjoy it when cut it up into very small pieces (smaller than their usual tofu cubes). They liked the bacon flavoured one we recently put on pizza. I have trouble finding plain tempeh where I live, I am in the process of looking for more sources of it because we would like to eat more tempeh and less tofu, since tempeh is less processed. I plan to experiment with a number of marinades on it, as I have read marinated tempeh is fabulous. If you are lucky, you can find plain tempeh in health food stores and in many supermarkets near you, either refrigerated or frozen. You can buy tofu at your local supermarket or grocery store or health food store in a refrigerated section. It comes in packaged bricks or blocks. In Asian Markets tofu is often sold in bulk with blocks floating in tubs of water. What is a Substitute for Tofu? A tofu substitute you can use is edamame – which are green soybeans. They are soft, yummy beans that are very satisfyingly chewy and rich – kind of like an avocado and a peanut, but much less oily. I find they fill me up quite quickly probably due to their protein, fiber and the fat content (the essential kind of unprocessed fat we need to eat a little of each day). Edamame are not processed like tofu, they are whole foods. Edamame are a specialty soybean grown specifically to be picked and used in their immature stage. Edamame has small, fuzzy, dark green pods and a mild flavor. These soybeans have a higher protein and fat content than other beans. Their protein is complete, meaning that it provides the essential amino acids needed in one’s diet. Soybeans are equivalent to animal products in terms of protein quality. If you are lucky, you can find two types of edamame in your frozen vegetable section: shelled or still in their pods. The package directions will indicate if they are already cooked and ready to be thawed and eaten or if you need to steam or microwave them first. The edamame in pods are great as a snack — you have to work to pop each slippery soybean out. My daughter loves to sit and shell them for herself. The pre-shelled edamame are faster and can be used instead of tofu in your cooking. All health content on veganenvy.com is provided for general information only, and should not be treated as a substitute for the medical advice of your own doctor or any other health care professional. If you have any concerns about your general health, you should contact your local health care provider.